Pacelines are a great drill to have fun with intervals and simulate real riding outdoors. 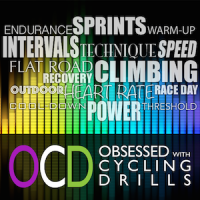 They work really well for long endurance segments to engage your riders or to simulate a race scenario. First, let’s define what a paceline is. When you ride outside, one of the more important obstacles to moving your bike forward is wind resistance. If you’ve ever ridden by yourself on a windy day, you know how frustrating it can be. A paceline is when a group of riders will line up one behind the other, with their wheels fairly close together. The riders at the front of the paceline are said to be taking a “pull,” and work much harder than those behind. 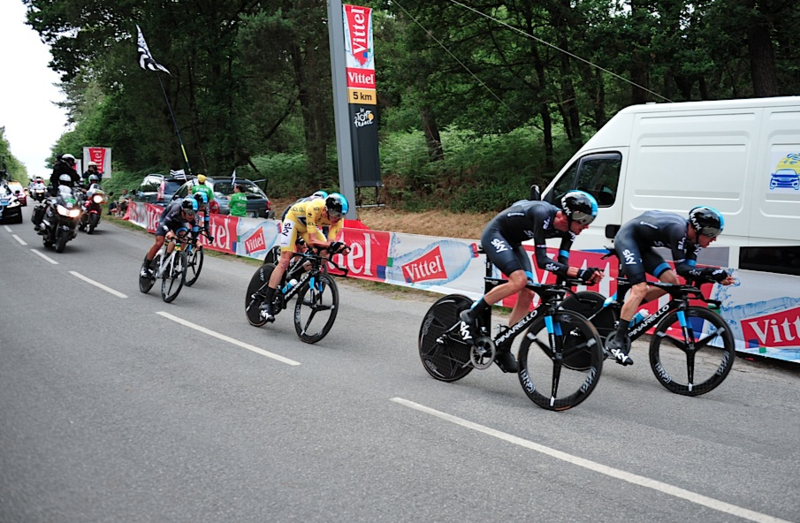 The riders behind have the advantage of the draft (also known as the slipstream) and don’t have to work as hard. Riders will share the work by taking turns pulling at the front. After a period of time, the lead rider will pull over to the side and slow down slightly to let the other riders pass. As the final rider passes them, they tuck in behind the group and “grab the wheel” of the last rider, settling into the slipstream. Wind tunnel studies show that drafting can reduce the workload by as much as 20%–25%. If you have a lot of distance to cover on your bike ride, it is the best way to share the effort while maintaining a faster speed than you could if you were riding alone. In a team time trial race, the entire team will ride the whole course with one continuous paceline. Read this excellent article by Michael Barry on the selflessness of the team time. There are scenarios in a race in which even riders on different teams will form a paceline in order to work together. This is because they understand the adage “none of us is as strong as all of us,” opponents or not. The paceline will break up as they get closer to the finish of the race when it becomes each man (or woman) for himself. At times, you’ll see riders in a breakaway angry at one of the other riders because he won’t work with them, and instead, only wants to draft. This is not a good way to make friends in the peloton, but it is surprisingly common! I first introduced pacelines to the Spinning® world at the World Spinning and Sports Conference in 2002 in a session I created called Pacelines and Cadence Drills. Surprisingly, they had never been taught at any Spinning or fitness conference prior to that. I’ve slightly modified the way I teach them since then, but they’ve always been a fabulous way to keep the class engaged. Everyone is usually amazed at how quickly those 15 or 20 minutes have passed! Now, I’ll explain how to simulate this great technique in your classes and give you some of the cues I use to keep my riders focused and some music selection tips. P.P.S……please act suitably surprised on FB..
Great article Jennifer. I love paceline drills……great way to teach a bit of physics and physiology. In real life, I could never hack a paceline…….I’m claustrophobic if anyone’s closer than 10 feet or so but on a SPIN bike, I’m a Legend In My Own Mind. P.S…..I have a similarly exciting pic I took of a paceline like this on the Golden leg of the US Pro Cycling Challenge a couple of years ago. I had my old cell phone and we were standing right on Washington with a clean view of the street……until the riders got close and everyone crowded me out on the safety barrier so I got down on my knees, stuck my phone between folks’ legs as far as safety allowed and just kept clicking on what I hoped was the region of the camera button. At least 3 fab. shots. Riding in a paceline outdoors does take some practice to get used to the proximity of other bikes. You need to really trust the abilities of the other rider! Fortunately, we don’t have to deal with that indoors. I really love the mental focus of riding pacelines indoors—it’s really great visualization. Now that we’ll be neighbors (well, only 2+ hours away) we’ll have to get together! Let me know when you are permanently settled, and hopefully, find a place to teach soon. I get down to the front range every now and then. Good luck on the house sale…and send some of that home sales juju our way.